Aggressive styling and a featherweight shell make the Nexx X-Wild Street a very potent contender within the premium sport and sport touring arena. Exterior sculpting diffuses air to create less drag which in turn produces less strain on your neck; this helmet cuts through the wind like a knife. 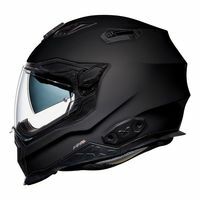 In addition to efficiently routing turbulent air around the shell, a refined array of intake and exhaust vents channel high speed air through the helmet to keep you cool as you’re carving up the corners. When the open road diverts towards the blaring sun, a drop down internal sun visor can be deployed in a quick haste. $20 Promotional Gift Card available on this product!